In the last issue we completed the discussion on turning spheres, and then fitted in jam chucking. This was not bad coverage for four pages, but well short of being complete. It might be that three to four pages on a topic, plus some overruns in subsequent issues should be reasonably adequate. The problem is partially one of self doubt, because inevitably one looks back after it has been sent to publishing, and thinks of things that could have been included (or omitted). Coverage of topics vary, and can't, of course, be perfect for everyone, because the fundamentals of any subject are inevitably going to under or over-shoot individual experience levels. We continue to have positive feedback on the series, but it would be helpful if we had more. If you are contacting us, perhaps you would include your view on a possible expanded Fundamentals book, with a decent terms glossary. 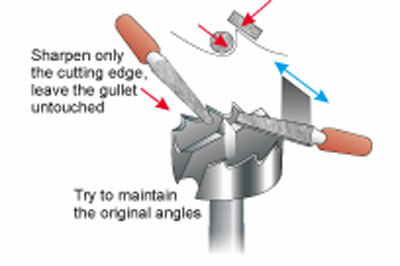 First off let's run through the various types of drilling and boring tooling for use on a woodturning lathe, but before doing so, and in order to avoid getting picked up on a point of correct nomenclature, you'll no doubt spot that the article uses the terms 'bit' and 'auger', for 'drills' they are not; even so it's more than likely that bits will still be called drills. These are primarily metal turning lathe accessories, and which may not be all that familiar to many woodturners, see Figure 1. They are, however, very useful in providing a means of cutting accurate 60 degree centre recesses to perfectly match the cone angle of standard live centres. They can be held in a hand drill, a drill press, or in a tailstock-mounted drill chuck as appropriate, thus avoiding concentricity problems of a recess being formed off the chosen centre mark position - an obvious boon where accurate multi-centre recesses are required. It also avoids the undesirable practice of creating a recess by forcing the tailstock centre into the workpiece. 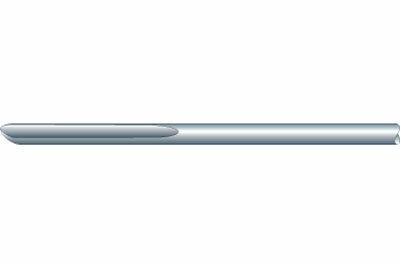 Centre bits are double ended, and are available in a range of sizes, with the most useful having a pilot lead diameter of 2-3mm with a body diameter of about 6mm (1/4in). 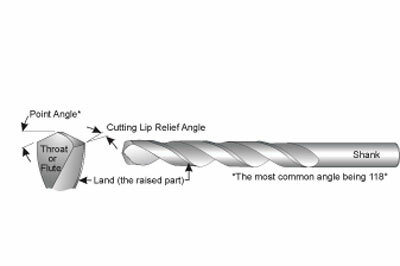 The plain versions, without 'spurs', see Figures 2a and Figure 2b, are predominantly designed for drilling hard manmade materials, such as metals, plastics, etc, and as such are usually made in high speed steel (HSS). For woodturners, this means the steel is more or less unaffected by the heat generated during re-sharpening on a grinding wheel. Although not specifically manufactured for drilling holes in wood, they can, and do, have a role to play, and certainly in very small diameters there is no other choice. 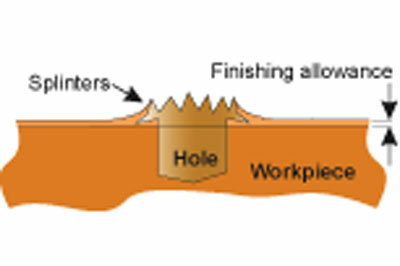 Perhaps the main fault is the splintering, or 'ragging' that occurs at the lip of a drilled hole, but this can often be overcome by drilling the holes whilst there is a small amount of material left on the workpiece as a cleanup allowance, (as shown in Figure 2c). 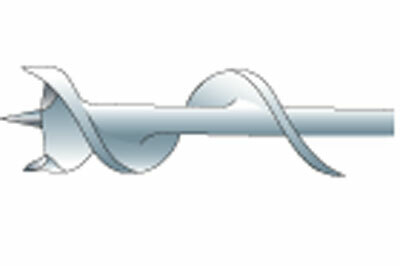 Spur-tipped bits are specifically designed for woodworking. 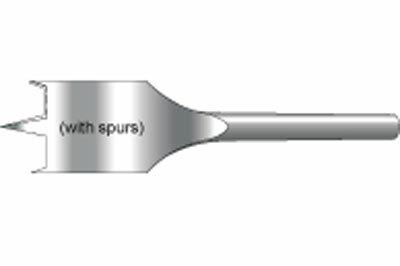 The spurs or 'nickers', provide a cutting action to slice through the grain fibres thus generally avoiding the splintering, or ragging, that occurs with ordinary twist bits. However, the precaution of leaving a small cleaning up allowance is still prudent. Here a similar approach is being used, but this time angling the cutting lip inwards to create a sharper tip form at the point of engagement, but retaining the centre point feature. This is not as effective as the true spur tip design, but superior to ordinary twist bits in terms of a clean entry into the workpiece. 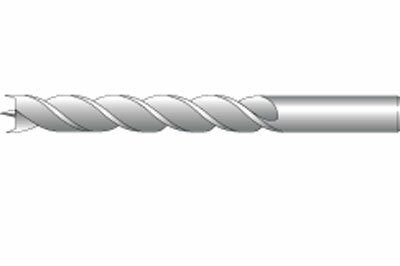 The size range of spur-type bits is generally in a range between 3mm (1/8in) and 20mm (3/4in) diameter. At the upper size range they are in competition with the sawtooth bits (multi-spur in the USA), and Forstner bits, and below 3mm diameter there is no choice apart from standard twist drill bits. 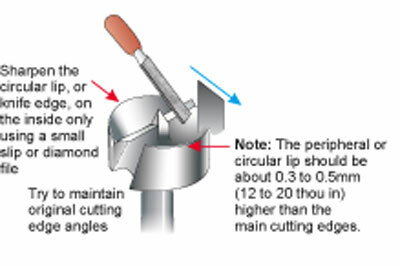 On the larger cutters, the most popular choice would be the sawtooth bit, see Figure 4a, as they cut more easily and quickly and with a little less force and frictional heat generation than a Forstner bit, see Figure 4b. Set against this is the fact that Forstner bits impart a superior surface finish to a hole, and a slightly better square- bottom finish. The available range of sizes depends on the manufacturer, but generally within the range of 7mm (1/4in) to around 100mm (4in) diameter. Where, in size terms, the choice to move away from spur-type bits is made, it is partially a matter of personal preference and the required quality of hole finish. 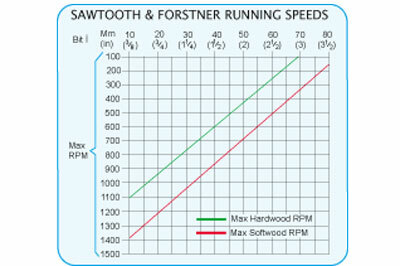 There are other bit designs that could be considered, but generally where larger diameters are concerned, the choice is clearly between sawtooth and Forstner. A good quality auger of both types is quite a bit more expensive than spur bits. This presupposes that purchasing criteria be a combination of performance and long-term economic value, rather than buying at a cheap price; there are plenty of inferior ones to choose from. One further factor is how the bit is to be guided into the workpiece. If the method of guiding requires some accuracy in the approach angle using a proprietary steel drilling jig or guide - more of which later - spur-lipped bits are easier to work with and are less likely to be damaged by contact with the bore of the said jig. Drilling from the tailstock is not affected by this consideration. Some consideration needs to be given to minimising the heat generated by keeping down the running speeds for these larger bits, and in particular with Forstner bits as they generate more heat from friction than other types. This is because the rim action is that of a knife which cuts by being pushed into the workpiece, rather than with a sawing action. The chart shows the recommended maximum revelations per minute (rpm) relative to the cutter diameter. Maintaining sharp edges, particularly on Forstner bits, is important. Frequent touching up on the cutting edges is preferable to having a grand session well after any reasonable edge has come and gone. Apart from simply having bits with good, clean cutting ability, it is easier to preserve the original angles and edges if the dressing of the bits only requires light attention. For the purpose of accessing the various surfaces and shapes, a selection of 'fine' or 'very fine' grade diamond files is recommended, see Figure 4c and Figure 4d. 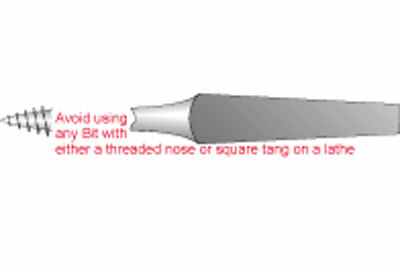 And one big 'do not' - do not ever file the outside diameter of either bit. 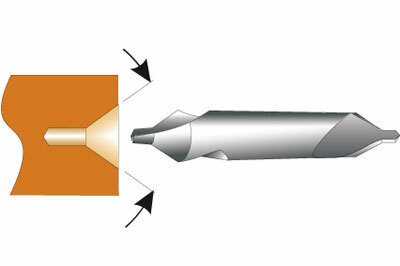 Sawtooth and Forstner bits can be used to bore much deeper holes, such as the first stages of hollowing a deep vessel, by the addition of an extension shank, as shown in Figure 4e. 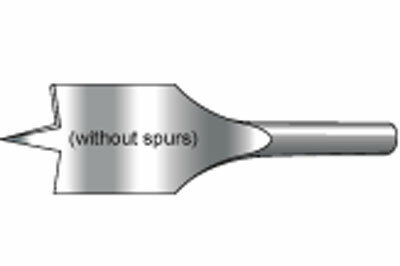 Extension shanks usually have 12mm (1/2in) diameter or bores which match exactly the shank diameter of the bit. The head of the extension shank would be about 21mm (53/63in) diameter, so in practical terms they are only practicable for bits larger than 22mm (7/8in) diameter. Generally, the extension adds about 150mm (6in) extra reach for the bit. They may be hard to find, but there are companies in the world that make other, smaller diameters to take 6-8-10mm shanks, and in a variety of longer lengths. Perhaps it is stating the obvious, but the production of holes can also be achieved using a much wider range of drilling bits than is practicable to include in this article. Hence limiting the range to try and set out a fair representation, and a fundamental understanding of the differences of the bits that are currently available. 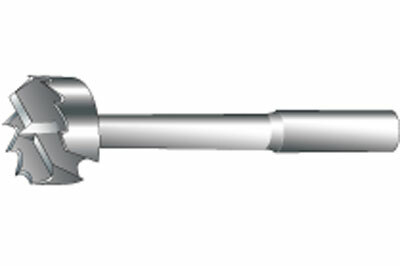 A considerable number of bit design variants in the world are too specialised to be of fundamental interest, because they are just adaptations of standard tooling, such as stepped diameter bits, integral counterbore bits, or those bits that only possess a marginal difference from those included in this article. And, of course, there are still plenty of older bits in the world, such as say, a 'Scotch' bit, which undoubtedly a turner somewhere in the world uses to start a workpiece hollowing process, but in practicable terms is the same as a 'Jennings' pattern bit, see opposite, without the spurs. 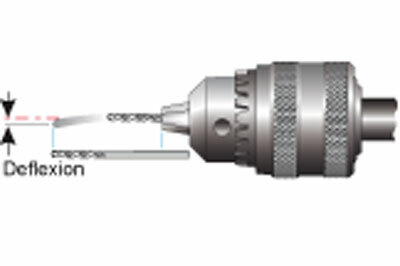 Also known as an expanding bit, or an adjustable bit, due to the design feature that allows the cutting blade components to be set for any hole diameter within the size range limit of each particular bit, see Figure 5a. Most expansive bits typically have ranges like: 16mm (5/8in) to 45mm (1 3/4in), or 20mm to 50mm (2in) diameter. However, some are supplied with interchangeable cutting facilities: 22mm (7/8in) to 76mm (3in) diameter. They have a single spur, and flat blade arrangement to produce a square-bottomed hole, but generally of a poorer quality than is achievable with sawtooth or Forstner bits. If this type of bit appeals, then, for safety reasons at least, some care needs to be exercised in choosing both make and model. Only consider the sturdy ones specifically designed for use in power tools, and if itâ€™s to be used in a drill press, or on the lathe, then only consider the ones that have a captive clamping plate/blade assembly. Running speeds are difficult to suggest because of the different designs. The wisest advice suggested running as slowly as possible, but for a robust bit in the right circumstances, running speed would be similar to a sawtooth bit. 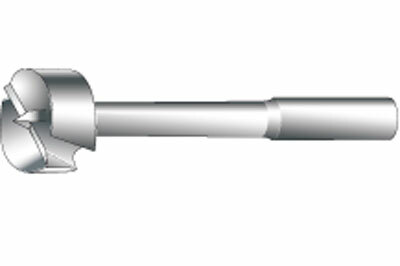 There are other bit types, such as the machine auger bit (shown in Figure 4b), also known as a levin, or universal bit. As you'll see, it has a helical form with a single spur and either one or two cutting lips. 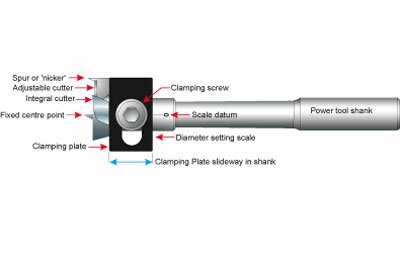 Most bits of this type are really designed for hand or power drilling, as they often have a tap form or spiral worm nose point to pull the bit into the workpiece, and are therefore not desirable iheld in the tailstock of a lathe. 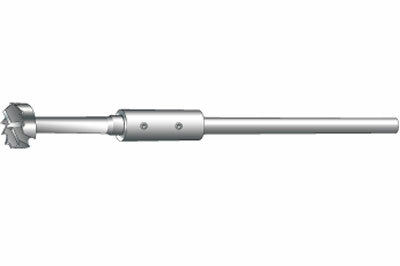 They are available in a wide range of diameters from 6mm (1â�„4in) to 32mm (1 1/4in), and in a wide range of lengths from short 'hobby' models to around 600mm (24in) in length. 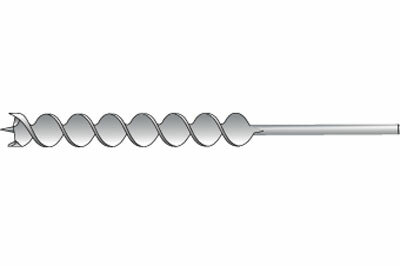 The running speed is similar to spur tip bits.